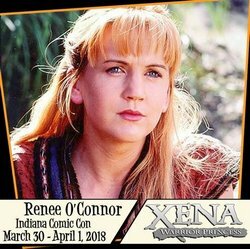 AUSXIP Renee O'Connor News - Upcoming Convention for Renee: Indiana Comic Con March 30-April 1, 2018! Upcoming Convention for Renee: Indiana Comic Con March 30-April 1, 2018! New Convention appearance by Renee and a message from Renee about the convention below! Renee O'Connor will be a guest at the March 30 - April 1, Indiana Comic Con at the Indianapolis Convention Center! Renee is best known for her role as Gabrielle on Xena: Warrior Princess! Appearing Saturday and Sunday only.